By popular demand, the deadline for the World Championships Fence-Sitter Package has been extended an additional week! Order by Friday, July 10 (5 p.m. ET), to take advantage of this very special offer. Offer only good while supplies last. Act today! Offer good from Monday, June 29 through Friday, July 10 – while supplies last. All sales are final. No refunds/exchanges under any circumstances. Tickets are from best available in the Premium price level (your choice of 100 or 600 level). 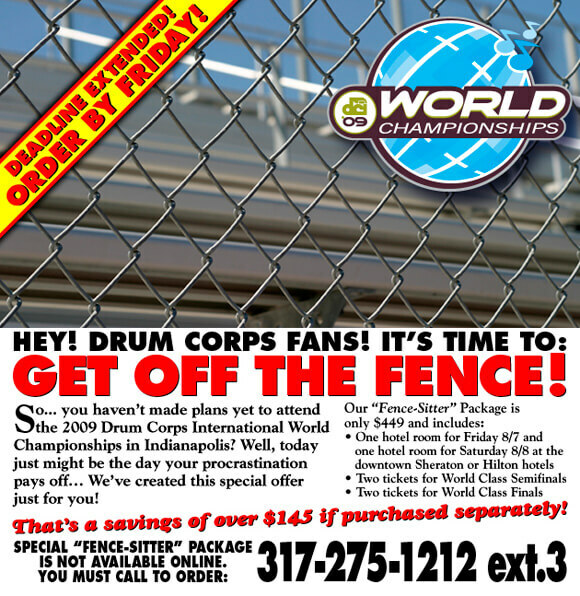 In order to take advantage of this very special offer, you must call the Drum Corps International Box Office at 317.275.1212 x3 to purchase the Fence-Sitter Package. Tickets will be available at the Lucas Oil Stadium Will Call Window on Friday, Aug. 7 for both events. Other World Championship events currently on sale include: Open Class Semifinals, Open Class Finals and World Class Quarterfinals. No substitutions or alterations may be made to this offer. Drum Corps International reserves the right to modify or cancel promotion at any time. There is no limit to how many packages you can purchase, however, additional tickets or hotel room nights purchased separate from Fence-Sitter package will be charged at full price.